"You mean I don't have to buy you anything for your birthday, you just want me to take you bird hunting?" asked my husband of ten years. Ah, how times have changed. Once upon a time we would have dressed up for dinner at a fine restaurant, enjoyed a romantic meal with wine and champagne, and ended the evening opening gifts. Now we would wear field clothes and carry shotguns, our dinner would be birds we would clean and cook together, and our fingers would be bloodied from pulling cockle burrs out of the feathers on our spaniels' ears and legs. Somehow, I wouldn't have it any other way. 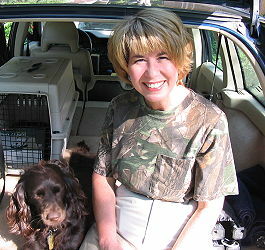 Edie, my Boykin spaniel, was seven months old the first time we took her to the field. We were at the plantation of a family friend in west Tennessee where there had been a quail hunt earlier in the day. By late afternoon we expected the quail to have coveyed up, promising a good opportunity to put Edie on birds. As I have often told the story, I committed to train Edie to hunt and retrieve as a condition of her sale, but I had never been bird hunting much less trained a retriever. My closest outdoor experience was listening to the stories my high school sweetheart and his family told about the duck hunts with their black labs. And that was a long time ago. "The farm tractors had cut deep furrows in the ground so my attention was divided between where I was placing my feet and watching my dog work." Welch borrowed a twenty gauge shotgun and with Edie on lead we walked down a red clay and gravel road into the field. Rainfall had been heavy that week and the ground was muddy. As we approached an area Welch thought would hold birds, he had me release Edie. Natural ability is an amazing thing to watch. Without encouragement Edie put her nose to the ground and began to work the field in front of me in a figure eight pattern. The farm tractors had cut deep furrows in the ground so my attention was divided between where I was placing my feet and watching my dog work. Then, in an instant, everything changed. I watched in amazement as a covey of six or eight quail burst from the cover with a furious whirring of wings, and separated in all directions. Beside me Welch chose his bird, pivoted to the left with a smooth easy motion, but couldn't get the safety off the gun in time for a shot. Edie was electrified, bouncing up in the air to see where the birds flew, then tearing after the stragglers and putting them in the air again. Certain that there were more coveys, Welch had me collect Edie and put her back to work. As we walked behind her, she quickly put up another covey, scattering them in all directions. To this day I remember watching the scene unfold as if in slow motion. The covey rise was marked by the explosive sound of furiously beating wings, then the click of the safety as Welch shouldered his gun rotating to follow the birds as they took flight and finally the thunderous report of the shotgun. Watching as a quail dropped to the ground, Edie made the wonderful connection all hunting dogs must learn, "Bang means bird." As I look back, that moment marked the beginning of a journey that has introduced me to countless new friends and taken me to places both far and near that I might never have visited otherwise. Five years ago I sat down in a hotel room in Columbus, Georgia and began to write about my first experiences competing in Hunting Retriever Club (HRC) Hunt Tests with Edie. I still have that first hand-written draft. At the time I didn't have a clear vision of what I wanted to achieve with my story-telling, but I knew I could entertain people while gently poking fun at myself. To this day I still have people tease me about trading my Junior League image and Volvo station wagon for knee boots and an SUV. But as time went on and I began to look at the broader landscape of hunting, sportsman's rights and the declining number of hunting permits issued each year, I realized my writing might serve another purpose. Through sharing my experiences, if I could just get one little girl, one young woman, one wife or mother to go out in the field and experience the joy of watching a trained dog work, perhaps we could add our voices to those of our male counterparts. In turn, if one husband or father included their wife or child in a trip to the field, think of the memories they could make together.